MORGANTOWN, W.Va. (AP) — Will Grier has cut the long locks that helped earned him the nickname “Touchdown Jesus,” yet the beard remains. More importantly, the West Virginia quarterback’s broken middle finger on his throwing hand is mended and he’s ready to lead the Mountaineers to even better things on offense in 2018. And the do-it-all Grier has learned one thing heading into his senior season — he doesn’t necessarily have to try so hard to make plays. 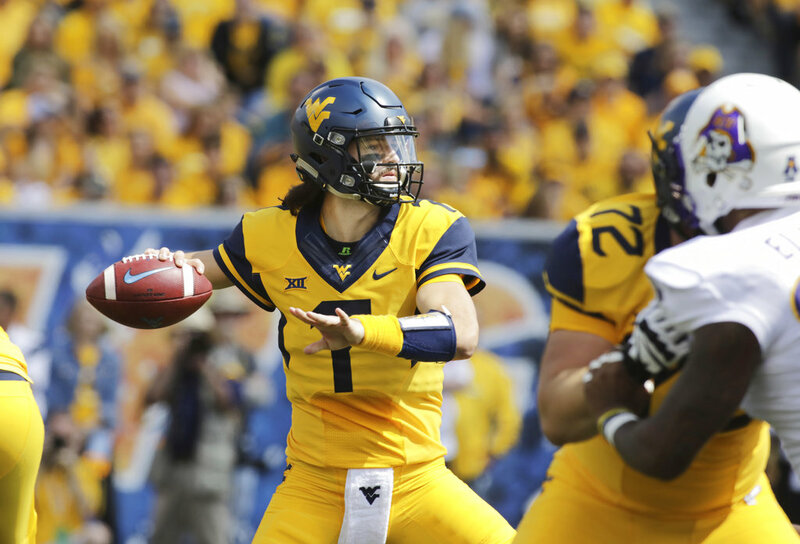 The Mountaineers, who went 7-6 last season, are hungry for a Big 12 title that has eluded them since joining the league in 2012 and are buying into the hype for now, even launching a Heisman webpage for Grier. With Grier and West Virginia wide receiver David Sills returning and others added to the mix, the Mountaineers are hoping they can put up offensive numbers similar to a year ago. Grier’s 34 TD passes in 11 games were the second most in a single season for West Virginia. He completed 64 percent of his passes for 3,490 yards. Sills tied for the national lead with 18 TD catches. DEFENSE QUESTIONS: As in past years, the Mountaineers’ success likely rests with its defense, which has nine players with starting experience back on a unit that ranked last in rushing defense and eighth in total defense in the Big 12. The defense is anchored by junior linebacker David Long (75 total tackles, 15.5 tackles for loss), and senior safety Dravon Askew-Henry (57 tackles). For instance, West Virginia faced a fourth-and-5 against Virginia Tech on the last drive of the 2017 season opener. Grier scrambled nine yards to keep the drive alive, although WVU lost 31-24. “I’ve got to go get that first down and do whatever I can,” he said. NEW FACES: West Virginia has several transfers on board, as Holgorsen seems to do every year, including Grier last year from Florida. This time, the Mountaineers welcome wide receiver T.J. Simmons, who played on special teams at Alabama as a freshman two years ago. Tight end Jovani Haskins sat out last year after transferring from Miami and has yet to play a down in college. After defensive linemen Adam Shuler and Lamonte McDougle transferred, graduate transfers Kenny Bigelow from Southern Cal and Jabril Robinson from Clemson were added. The defense also welcomes junior college safety Josh Norwood, who played in 2016 at Ohio State. BALL CARRIERS: Kennedy McKoy will take over for two-time 1,000-yard rusher Justin Crawford. McKoy ran for 596 yards and tied Crawford for a team-high seven TDs. Backup Martell Pettaway figures to get significantly more carries than the three per game he had last year, while redshirt freshman Alec Sinkfield and freshman Leddie Brown could get some playing time. SCHEDULE: West Virginia has two Power Five opponents on its nonconference schedule. Besides the opener, West Virginia will play at North Carolina State on Sept. 15. The Mountaineers have five Big 12 home games, including the conference opener Sept. 22 against Kansas State. Their regular season will conclude with a tough stretch against TCU and Oklahoma at home sandwiched around a trip to Oklahoma State.